White House spokesman Robert Gibbs agrees that the situation was "bungled"
Washington (CNN) -- Agriculture Secretary Tom Vilsack said Wednesday he apologized to Shirley Sherrod for forcing her to resign from her government job in Georgia based on incomplete and misleading reports of a speech she gave. Vilsack told reporters that he alone made the decision regarding Sherrod, with no White House involvement. He spoke to Sherrod earlier Wednesday and said he asked for her forgiveness, which she gave. Vilsack also said he offered Sherrod another job in the department, and she was taking a few days to think about it. "She's a good woman -- she's been put through hell," Vilsack said of Sherrod. He admitted acting too hastily in the case, acknowledging that he was focused on reversing a history of racial discrimination at the agriculture department. Video: Who asked Sherrod to resign? In an interview with CNN later Wednesday, Sherrod said she told Vilsack she accepted his apology and that "we could move on." She also acknowledged being "really hurt" earlier this week by accusations of racism due to the portions of her speech made public. Sherrod, who is African-American, was forced out after conservative website blogger Andrew Breitbart posted a portion of a speech she gave in which she spoke of not offering her full help to a white farmer. The original post by Breitbart indicated the incident Sherrod mentioned occurred when she worked for the agriculture department, and news outlets quickly picked up on the story. However, the incident Sherrod mentioned occurred years before she joined the department, and her speech went on to explain how racial-based thinking must be overcome. In addition, the white farmer who Sherrod mentioned has told reporters that Sherrod helped him save his farm. "Correction: While Ms. Sherrod made the remarks captured in the first video featured in this post while she held a federally appointed position, the story she tells refers to actions she took before she held that federal position," said a notice added to one of the postings on Breitbart's biggovernment.com website. Earlier Wednesday, White House press secretary Robert Gibbs apologized on behalf of President Barack Obama's administration. "A disservice was done. An apology was owed. That's what we've done. Decisions were made based on an incomplete set of facts," Gibbs told the White House news briefing. Agriculture Secretary Tom Vilsack said he will conduct a thorough review and consider additional facts in the Sherrod case. Gibbs agreed with a questioner who asked if the matter had been "bungled." "I think this is a fair way to put it," he said. "Members of this administration, members of the media, members of different political factions on both sides of this have all made determinations and judgments without a full set of facts. I think that is wholly and completely accurate. I think, without a doubt, Ms. Sherrod is owed an apology." Gibbs added that "we live in a culture [in which] things whip around, people want fast responses, [and] we want to give fast responses. One of the great lessons you take away from this is to ask all the questions first." Vilsack blamed himself for the decision to force Sherrod's resignation, saying: "I did not think before I acted. For that reason, this poor woman has gone through a very difficult time." No one at the White House, including President Obama, called for her firing, both Gibbs and Vilsack said. Vilsack also said he had not spoken to Obama about the matter. In a separate statement issued by his office, Vilsack referred to Sherrod's background as an African-American whose family "endured discrimination and overcame adversity." "As U.S.D.A's Georgia State Rural Development Director, she worked to promote economic opportunity for all people by enabling job creation and business growth," Vilsack's statement said, adding that Sherrod "has shown tremendous character through the events of the last few days." Vilsack noted that "with all that she has seen, endured and accomplished, it would be invaluable to have her experience, commitment and record of service at U.S.D.A.," adding, "I hope she considers staying with the department." Sherrod, who was watching the Gibbs news briefing Wednesday afternoon from CNN's headquarters in Atlanta, Georgia, clapped and smiled about the apology. Sherrod had said the agency's decision to review her case is "bittersweet," but said she isn't sure she would accept her job back if it is offered. "If they had just taken the time to -- even without looking at the tape -- to look at me, to look at what I've stood for, to look at what I've done since I've actually been at the department, I don't think they would have been so quick to do what they did and so insistent," Sherrod said. "... To now come back and say, 'Well, we're willing to look at this,' it definitely is a little bittersweet." In her work at the department, Sherrod said, "I didn't make a lot of noise. ... I worked for fairness for everyone." In the video, Sherrod can be heard telling an audience at a March 27, 2010, appearance before a local chapter of the NAACP that she had not given a white farmer "the full force of what I could do" to help him save the family farm. But later in the tape, in the portion not originally posted, Sherrod says, "working with [the farmer] made me see that it's really about those who have versus those who have not. They could be black. They could be white. They could be Hispanic." The video initially brought condemnation from the NAACP, which later retracted its statement and apologized to Sherrod after the context of the clip became clear. Also, the farmer and his wife Sherrod was discussing, Roger and Eloise Spooner, came forward Tuesday, saying that they credited Sherrod with helping them save their farm and that she did not discriminate against them. The NAACP, which initially called Sherrod's statements "shameful," said in a statement Tuesday that it was "snookered by FOX News" and Breitbart. Breitbart originally posted the video, which was later picked up by the FOX News website. "Having reviewed the full tape ... and most importantly heard the testimony of the white farmers mentioned in this story, we now believe that the organization that edited the documents did so with the intention of deceiving millions of Americans," the statement from NAACP President Benjamin Jealous said. FOX News anchor Bret Baier said Wednesday that "FOX News didn't even do this story. We didn't do it on Special Report. We posted it online." The NAACP also had urged Vilsack to reconsider Sherrod's resignation from her post. And the Congressional Black Caucus said in a statement Wednesday that Vilsack "did not have all of the facts available to him and overreacted." Vilsack met later Wednesday with caucus members, but offered no comment afterward. Democratic Rep. Barbara Lee of California, the chairwoman of the Congressional Black Caucus, told reporters that Vilsack did the right thing by apologizing to Sherrod and offering her a new job. Conservative media outlets tied the video to the NAACP's recent resolution calling on the Tea Party movement to repudiate racist elements within it that have displayed such items as images of Obama with a bone through his nose and the White House with a lawn full of watermelons. The controversy has led one Tea Party umbrella group to oust another because of a blog posting by the second group's leader. Tea Party Express leader Mark Williams posted on his blog a faux letter from Jealous to President Abraham Lincoln in which Williams ridicules the organization's use of "colored" in its historic name and uses multiple stereotypes to bolster his point. The National Tea Party Foundation expelled Williams' organization from its coalition as a result. Breitbart told CNN's "John King USA" on Tuesday that releasing the video was "not about Shirley Sherrod." "This was about the NAACP attacking the Tea Party, and this is showing racism at an NAACP event," he said. "I did not ask for Shirley Sherrod to be fired." Sherrod said Tuesday that she "went all out" to help the Spooners keep their farm in the 1986 incident, which occurred before she started working for the USDA and was at the nonprofit Federation of Southern Cooperatives Land Assistance Fund. She said she resigned after receiving four phone calls Monday telling her the White House wanted her to step down. She was driving at the time, and in the last phone call, she was asked to pull to the side of the road and resign, she said. 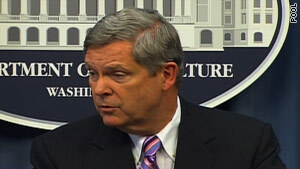 Vilsack and Gibbs said the White House played no role in seeking Sherrod's ouster Monday. However, Gibbs said that when further details of the matter emerged, the White House contacted the agriculture department on Tuesday night to ensure that fairness ensued. White House aides said Wednesday they were doing all they can to distance Obama from the controversy. The poor-quality video shows Sherrod telling her audience that Spooner, the farmer she was working with, "took a long time ... trying to show me he was superior to me." As a result, she said, she "didn't give him the full force of what I could do. I did enough." To prove she had done her job, she said, she took him to a white lawyer. "I figured that if I take him to one of them, that his own kind would take care of him," she said. But that lawyer failed to help, she said Tuesday. "I did not discriminate against [the farmer]. And, in fact, I went all out to frantically look for a lawyer at the last minute because the first lawyer we went to was not doing anything to really help him. In fact, that [first] lawyer suggested they should just let the farm go." "I don't know what brought up the racist mess," Spooner told CNN's "Rick's List" on Tuesday. "They just want to stir up some trouble, it sounds to me in my opinion." Spooner says Sherrod accompanied him and his wife to a lawyer in Americus, Georgia, who was able to help them file for Chapter 11 bankruptcy, which ultimately saved their farm. "If it hadn't been for her, we would've never known who to see or what to do," he said. "She led us right to our success." Eloise Spooner remembered Sherrod as "nice-mannered, thoughtful, friendly; a good person." She said that when she saw the story of the tape and Sherrod's resignation on television, "I said, 'That ain't right. They have not treated her right.' "
Sherrod, who was appointed to the USDA position in 2009, said she first heard of the possible controversy when someone e-mailed her last Thursday to taunt her about her comments. She immediately forwarded the e-mail to the USDA so the agency would be aware. She was told that someone would look into it. She said it wasn't until Monday that she heard back, and by then, she was being asked for her resignation. Asked if she felt she had an opportunity to explain, Sherrod said, "No, I didn't. The administration, they were not interested in hearing the truth. No one wanted to hear the truth." Ralph Paige, executive director of the Federation of Southern Cooperatives Land Assistance Fund, told CNN on Tuesday that Sherrod had garnered only praise during her time there and that there were never any claims of discrimination against her. "I can't praise Shirley enough," he said. "She holds no malice in her heart." Vilsack said in a statement Monday he had accepted Sherrod's resignation, noting a "zero tolerance" policy for discrimination at the USDA. "I strongly condemn any act of discrimination against any person," he said. The first statement that the NAACP issued late Monday backed Vilsack's decision. On Tuesday, Sherrod called the NAACP "the reason why this happened. They got into a fight with the Tea Party, and all of this came out as a result of that." "When you spend your life helping others and see people try to turn that around to try to make it look like you're a racist when that's not been what your life has been about -- that doesn't feel good," she said. Sherrod and her family were part of a lawsuit filed in 1997 against the Agriculture Department that charged it discriminated against black farmers by denying them timely loans or debt restructuring. Complaints of discrimination began piling up after the Reagan administration shut down the department's civil rights division in 1983, and the lawsuit covered the years between 1983 and 1997. A district court judge eventually combined two such lawsuits into a class action, and the two sides reached a settlement in 1999. The agreement gave each plaintiff $50,000 plus loan forgiveness and tax offsets, provided the plaintiff met certain criteria (Track A), or the possibility of a larger amount by showing evidence of greater damages (Track B). More than 22,000 farmers applied -- far more than the 2,000 expected -- and more than 13,000 were approved for the $50,000 award. Fewer than 200 farmers opted for the Track B process. Sherrod and her husband were part of the lawsuit because of the land trust they started in the 1960s along with several other black families. Ultimately, their land trust -- New Communities -- was awarded $13 million, mostly for loss of land and loss of income and including $300,000 for the Sherrods, according to the Rural Development Leadership Network. Vilsack, who is now the defendant in the lawsuit -- Pigford vs. Vilsack -- as final details are worked out, referred to the discrimination lawsuit and other similar suits in a statement announcing that he had accepted Sherrod's resignation. "We have been working hard through the past 18 months to reverse the checkered civil rights history at the department and take the issue of fairness and equality very seriously," Vilsack said. CNN's Suzanne Malveaux and Tristan Smith contributed to this report.